Innovative nutritional ingredient company Natreon, aligning with consumer demand for GMO transparency, obtains Non-GMO Project verification for its portfolio of botanical ingredients. Consumer demand for non-GMO foods, beverages and dietary supplements continues to increase, and Natreon is responding in order to provide added value for our customers. Natreon, Inc., an innovative ingredient supplier known for its patented ingredients derived from nature, is pleased to announce that it has earned Non-GMO Project verification for each of its six ingredients. 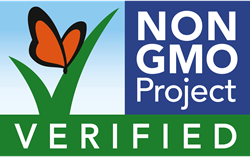 The Non-GMO Project (http://www.nongmoproject.org) offers independent verification for products made according to rigorous best practices for GMO (genetically modified organisms) avoidance. Natreon’s portfolio of six branded ingredients are produced in compliance with the Non-GMO Project Standard, which means ongoing testing of all GMO risk ingredients, facility inspections, and an annual audit ensuring the company meets the highest standards currently available for GMO avoidance. To learn more about Natreon’s natural Ayurvedic ingredients, call 732.296.1080 or visit http://www.natreoninc.com.